Building a great website isn’t just about beautiful design and engaging content. If it was, website design would just be called art. Websites are interactive by nature, which means they must be more than simply beautiful. They need to be functional too. A great website is easy for people to use and helps them solve their problems. In short, it provides a great user experience. But what does the term “user experience” really mean when it comes to websites, and how can you make sure that your website experience is the best it can be? Let’s dive in! When it comes to websites specifically, UX involves everything your visitors are thinking and feeling when interacting with your website. Good user experience, then, is about creating positive interactions with your website. But understanding and being able to change the perceptions of your visitors seems like a monumental task. That’s where UX design comes in. UX design is the process of creating positive and valuable experiences for your visitors by improving the usability, functionality, and pleasure of interacting with a product (in this case, your website). And in some ways it is. UX dives into the science and psychology behind design. It’s full of laws, principles, and methodologies that are layered and complex, and UX designers do a lot studying and testing to understand all the elements of user experience. The process might be hard, but the overall concept is simple: UX design is about making your website easier to use and better at helping your visitors. Intuitively, I think we realize that UX is important because we’ve all known the frustration of bad online experiences. For example, what was your last online interaction with your cable provider like? From maze-like navigation to buried contact information to endless forms, bad UX design can be downright infuriating and makes you much more likely to leave the website and even avoid doing business with that company! We have come to expect a fast, frictionless online experience. When you make it easy for people, you create a positive experience that fosters trust and loyalty. And that equals more customers. In fact, one study showed that better UX design could improve website conversion rates by 400%. How can you make sure your website provides a good user experience, without being a UX expert? Here are a few best practices that will teach you what to look for and ways that you and your web designer can improve the user experience for your website. The visual design and user experience of your website are closely related. That’s not to say that a beautiful design will solve all your problems. There are plenty of pretty websites out that are awful to use. And there are ugly websites that are highly functional (think Craigslist). But even ugly websites can’t ignore all the basics. Using principles of good design like visual hierarchy, white space, readable fonts, etc. will help guide your users’ eyes so they can find what they’re looking for quickly and easily. Check out Chapter 2 on the Basic Principles of Good Web Design for more details. I can’t say it enough: make your website as simple as possible. People have notoriously short attention spans, so the simpler it is to understand and use your website, the more likely they are to stay and have an enjoyable experience. Simplicity is one of the key concepts of UX design. Ironically, it’s often complex to actually do. Today’s users are more demanding than ever – they want experiences that are engaging, personalized, and seamless across different channels and devices. The more things your website has to do, the harder it is to keep it simple. For example, an e-commerce site needs to do a lot more things than a typical website. It needs to have a shopping cart, take credit card information, and process orders. It would actually be a lot simpler if it didn’t do all those things. But that wouldn’t make for good user experience, either. Your job is to streamline the process and make it as simple as possible to buy from you, without sacrificing usability. Make your next web project a success! Navigation is how people move around on your site, making it one of the most important elements of your website functionality. Like a GPS for your website, your navigation should help people orient themselves and travel through your site to their destination. Remember that the purpose of your navigation is to help your prospects and customers find what they’re looking for. It’s not the time to get cute or clever with your design. Put it where they expect it – People look for a navigation menu along the top or left-hand side of your website first. Don’t make them hunt for it. Don’t hide navigation – Some websites have started hiding navigation menus in order to make the design look cleaner and save space. While this may be necessary on a mobile device, avoid hidden menus on your desktop site. Use contrasting colors – Design your navigation so that it stands out visually from the content on the rest of the page and is easy to read. Keep it consistent – Put your navigation in the same place on every page, and use the same font, style, and colors. Otherwise, people may feel like they accidentally clicked off your site. Make it sticky – If you have long web pages, have the navigation stay in place as you scroll down. That way, you don’t have to scroll all the way back to the top to move to another page. Limit the number of choices – The more choices you give people, the longer it takes them to make a decision, and too many can actually lead to decision paralysis. A good rule of thumb is to keep your navigation to seven items or less. Avoid complex dropdowns – Done well, dropdown menus are a great way to group pages and save space. But if they’re poorly designed or have too many sub-menus, they can get clunky and cumbersome. If you need complex dropdowns in your navigation, consider creating a full-blown mega menu. Add a search box – Especially for large sites with a lot of pages (like e-commerce), many people prefer to search for what they’re looking for, instead of using a navigation menu. Imagine your website is a forest, and all your pages and content are the trees. When people arrive, you don’t want them to wander around aimlessly. You want to create trails and paths that lead them to become customers. 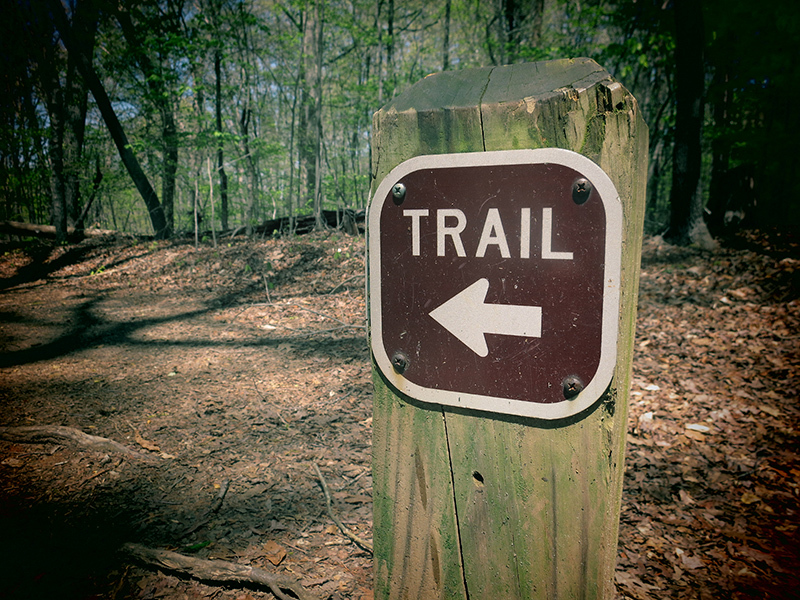 Creating a good user experience means designing paths that are clearly marked and maintained to prevent users from straying and getting lost in the woods. How do you do that? Always put yourself in your customers’ shoes, and try to use your website from their perspective. Do you make it easy for them to do business with you? Are there logical steps for them to reach their goals? Too often when designing a website, businesses miss the forest for the trees and forget about getting customers to their final destination. Next, use strong calls to action. These are the trail markers that tell people where they should go next. Make them big, bold, and obvious buttons, so users know they’re clickable. Powerful CTAs use strong, action-oriented verbiage that gives users clear instructions and motivates them to click. Finally, eliminate broken links. These are barriers on the road that prevent people from moving forward. In fact, often they cause your visitors to leave altogether! Studies show that 65% of visitors want to see your contact information once they hit your homepage. Readily available contact information improves user experience because it assures prospective customers that you’re legitimate and builds trust that they’ll be able to reach you when they need help. Have a dedicated Contact page on your website where you list your address, phone number, and email. Include a contact form to encourage people to reach out and share their information with you. Add contact information in other places around your site too. Putting your phone number in your main navigation, for example, makes it easy for customers and prospects to reach you from the second they hit your site. Your footer is also a great place to repeat the business’s name, address, and phone number. Live chat is also exploding in popularity, and research shows that it increases user satisfaction. Consider adding a live chat plugin to your site to offer immediate support. Your website only has seconds to make a good impression – don’t waste those precious seconds with slow-loading pages. People are impatient, and according to Google most won’t wait more than 3 seconds for a page to load. Especially with the rise of mobile devices, page load speed is more important than ever. As of July 2018, it’s now a ranking factor for mobile searches. So slow pages don’t just affect user experience, they can actually hurt your search engine rankings. Responsive (aka mobile-friendly) design is no longer an option. It’s a requirement. 60% of all Google searches are done on mobile devices – and that number is only continuing to rise. Like it or not, more and more of your visitors will be browsing your website on their phones and tablets. 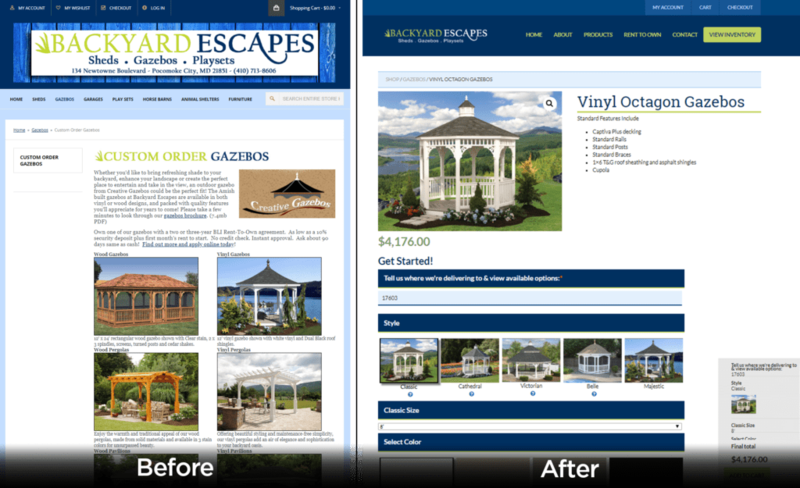 Your website experience needs to be just as good – if not better – on mobile as it is on desktop. Check out our article on how to make your website mobile-friendly for tips on how to improve the user experience for your mobile users. 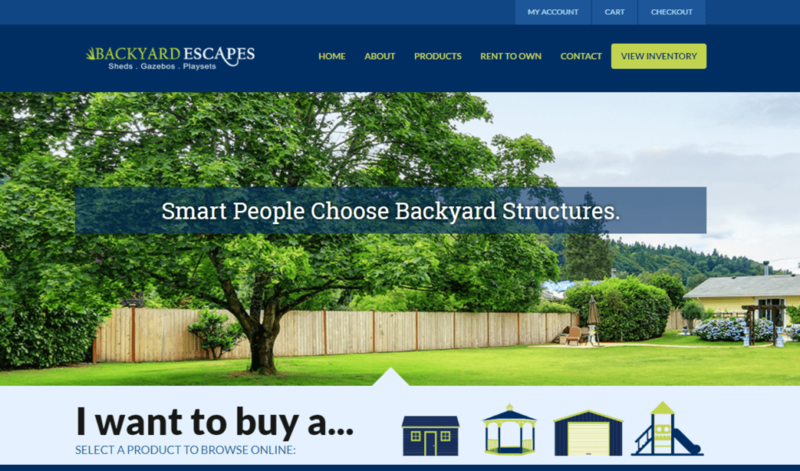 Backyard Escapes, an Amish-built outdoor structure company, provides a good user experience by guiding their visitors with simple choices and an effective interface design. The moment you hit their homepage, you’re given a simple choice: “I want to buy a…” This creates clear paths to their main product categories: sheds, gazebos, garages and playsets. Their main navigation is also clear and concise, in case they have visitors who want to browse around a little more. Since most of Backyard Escapes’ work is custom, their customers want to be able see all the options and personalize their outdoor structures before they buy. This created a big user experience problem with earlier versions of their website, which only showed sample photos of some options. So when they redesigned their website, they invested in an interactive builder tool that provided an easy way for customers to select the exact options they wanted, see pricing, and complete the purchase. This was a big win for Backyard Escapes. By giving their customers a clear path and easy-to-use tools to select their own perfect outdoor structure, they improved the user experience and boosted their sales. As the above case study proves, user experience design is not a once-and-done process. Like any other aspect of your marketing, it requires ongoing testing and adaptation to get the best results. Because UX professionals are a scientific bunch, formal UX testing can get very complex and time-consuming. So for the layman, what are some simple ways to test and improve your website’s user experience? This may sound obvious, but one of the easiest ways to figure out if you’re providing a good user experience is to ask real users. Talk to some of your prospects or customers and ask them what they like and don’t like about your website. Try to uncover features that are really important to them, and what things frustrate them. If you want more structured feedback, set up a poll or survey to ask for their opinions. Analytics measure how your website is performing, which can tell you a lot about your website experience. If your website is performing well, chances are, you’re providing a pretty good user experience as well. But poor user experience often goes hand-in-hand with poor performance. In your analytics, be on the lookout for things like low conversion rates, or a lot of people leaving your website after only a few seconds (bouncing). These are signs that people aren’t finding what they’re looking for, or don’t have a clear path through your site. Not sure how to understand and apply your analytics? Read on to Chapter 5 for more info!